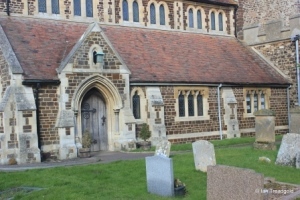 The church of Our Lady in Meppershall is situated in Church Road, to the south of the village. Parking is available outside the church. Reference: Leaflet available from the church. 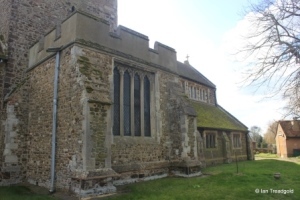 The church has an unusual shape for a church of its size being built in a cruciform shape with a central tower. 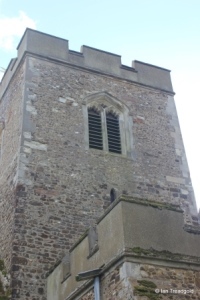 The tower and transepts form the oldest part of the church dating from C12. The tower is irregular in shape with the western end and nave being some 2 feet wider than the eastern end and chancel. 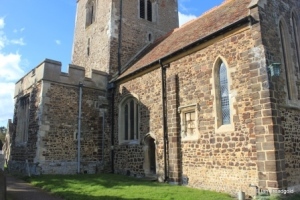 It is possible that the current layout derived from an earlier aisleless nave with the tower built on the site of the original chancel. The transepts and new chancel would then have been built surrounding the tower. The nave and aisles have been rebuilt in modern times. 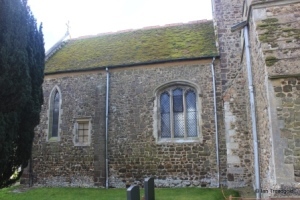 The original chancel was shorter than the current chancel having been enlarged eastwards in C12. 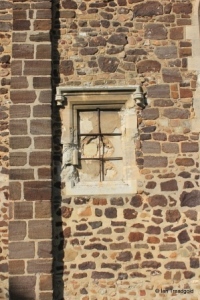 Whilst only the eastern pair of original lancets survives, traces of other similar windows have been left in the current fabric. 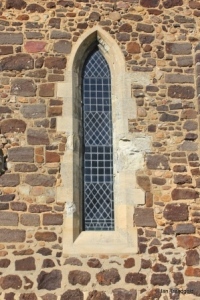 The south side of the chancel has the lancet window to the east and a curious blocked square headed blocked window to its west. 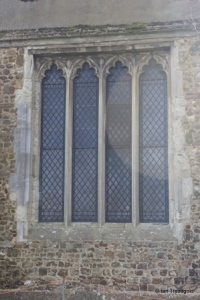 Dating from C15, this window and its equivalent on the north side retain their iron stanchions. Internally there is a shallow niche below the window but the purpose of the window is unclear. 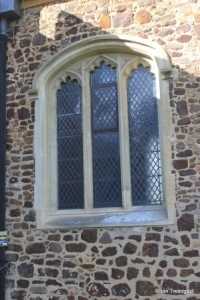 To the west of the blocked window is the priest’s door and a restored C15 three-light cinquefoiled window under a flattened four-centred arch. 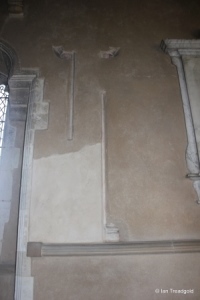 The south transept has no window to the east although there are signs of a staircase that leads to the tower. 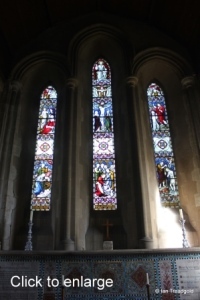 The south window of the south transept is four cinquefoiled lights under a square head. 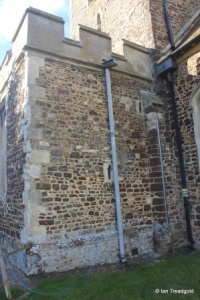 The parapet of the transept like that of the tower and north transept was restored in modern times being a simple render over bricks. The nave was rebuilt from the foundations in the 1870’s and the opportunity taken to add aisles on both sides with a clerestory above. The south aisle has two simple three light windows under square heads with a third single light window to the east of the porch. Porch is probably too grand a title for the simple doorway with gable over. The clerestory over the aisles has three pairs of conjoined lights with each pair being slightly recessed into the wall. 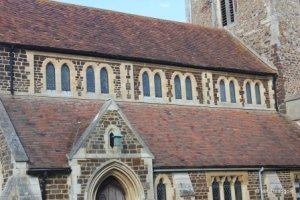 The 1870’s rebuilding of the nave and aisles uses ironstone to match the original building materials. 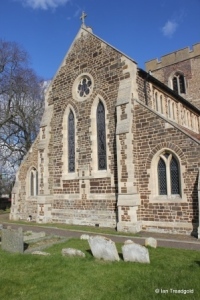 The west end of the church has two light windows under two-centred arches at the west ends of both aisles with no west door. 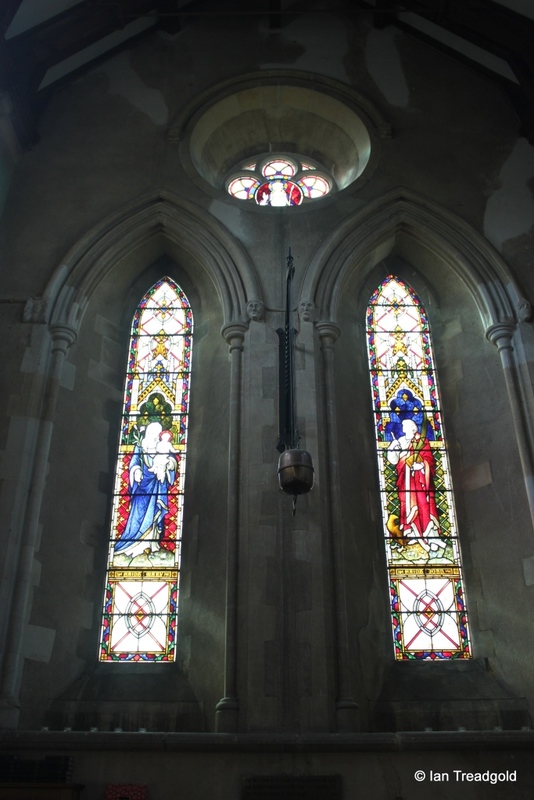 The west windows consist of two tall single lancets with a round window above. 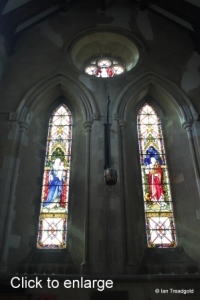 The glass in the lancets depicts St Mary and St John whilst the round window above depicts Christ. 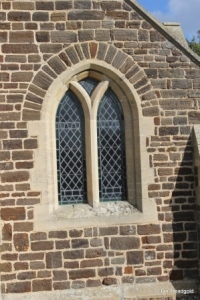 Some of the masonry of the windows re-uses that of the original nave. The north aisle matches the south with the difference that the three windows are all three light windows as there is no door to the north. 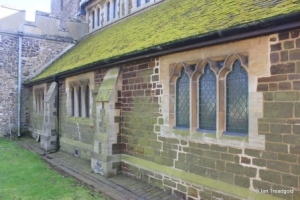 The north aisle roof is a good example of how moss prefers north facing slopes to south. 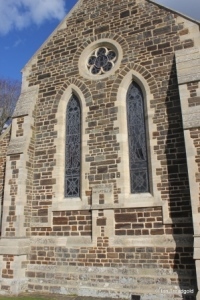 The north transept matches the south with the same style of four-light window under a square head. On the north side there are buttresses reflecting repair work done in C20. 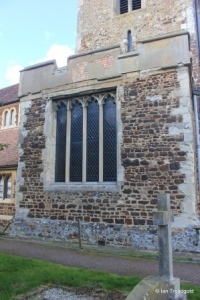 The north side of the chancel also matches the south with a single lancet to the east, the curious blocked square window and the three light window. There is no doorway to the north. 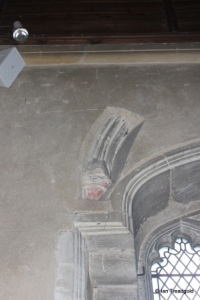 Internally the remains of the earlier lancet windows are preserved alongside their replacement three light four-centred window. 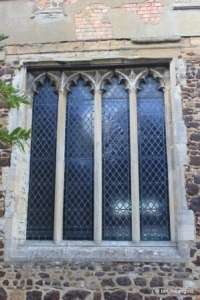 The east end has three lancet windows that were inserted during the restorations of C19 to replace a C15 window. 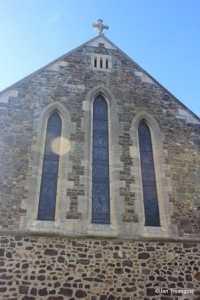 The glass in the window was inserted in remembrance of Elizabeth Howlett, the widow of the Revd Henry Howlett who was rector from 1845 to 1895 covering the period of the rebuilding of the nave and addition of the aisles. It depicts various scenes from the life of Christ. 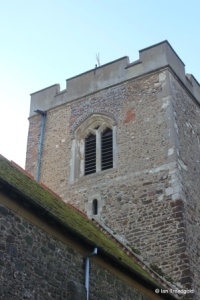 The tower is in two stages above the roofs of the nave, transepts and chancel with a modern embattled parapet. The belfry windows are of two cinquefoiled lights under a four-centred arch. The lower stage is lit by simple narrow lancet windows dating from C12. 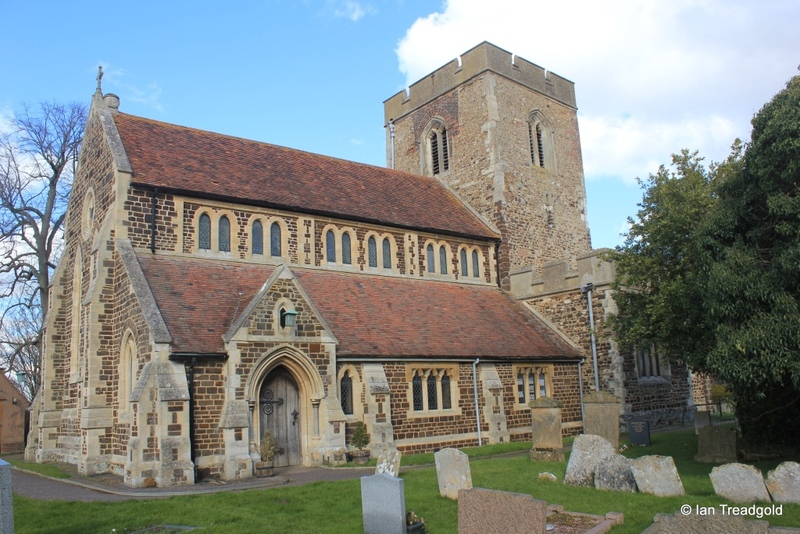 The south transept holds St John’s chapel, a chapel restored in 1948 to commemorate the men of Meppershall who fell in the Second World War and has an altar on the east wall. This is set within the remains of a C12 arch recess and has a piscina and stone bracket above. 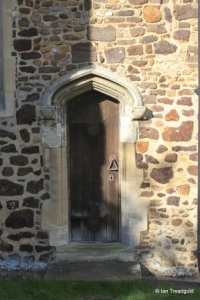 To the right is the doorway which leads to the tower. 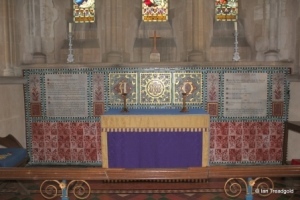 The main altar in the chancel has a tiled reredos displaying the Ten Commandments. 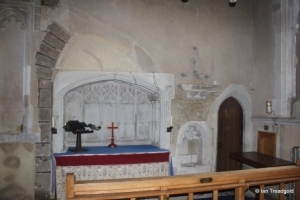 Within the chancel there are several monuments. 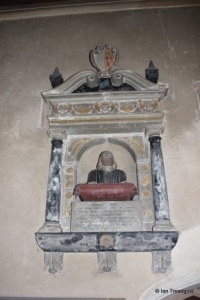 On the south wall is a monument to Timothy Archer rector of both this parish and Blunham. He died in 1672 aged 75. 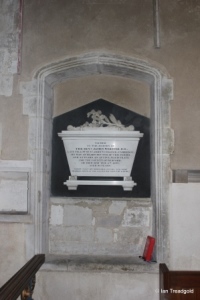 Also on the south side of the chancel is a monument to another rector, James Webster, who died in 1833 having served as rector for 43 years. 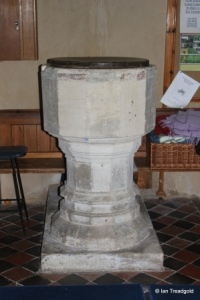 The font under the west window dates from C12 and is believed to be of Barnack stone or Barnack rag which was a valuable building stone from the area around Peterborough. The pedestal on which it stands is of Totternhoe stone. 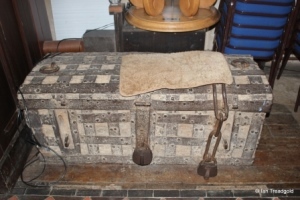 At the east end of the north aisle is a curious ancient wooden chest. Secured with chains and padlocks it probably dates from the middle C16 when parishes were required to keep registers of baptisms, marriages and deaths stored in a secure location.